Welcome to the antique hat parlors of Rue de la Paix. As a very special source for antique hats, antique millinery trims, vintage hats and exotic antique feathers, our private collections contain over 700 hats and thousands of antique trims and millinery supplies. We continue to offer a wide variety of antique and vintage hats for sale, so even if they are not featured here on these pages, please ask if you are looking for something special. Rue de la Paix has been continually evolving and I am now spending more time teaching, writing, consulting on hat collections, and conducting antique hat shows and vintage hat presentations. For information on Vintage Hat Shows, Hat Fashion Shows and Millinery History Events, please click on the links on the left. If you have a hat or hat collection you would like to find information about, or would like your hat appraised, please click the link to the left. Please scroll down to learn what else you might discover here. Enjoy! Rue de la Paix's overwhelming passion is HATS! I have been collecting, selling and researching antique hats and clothing for 35 years. Treasures from my collections have been used in major Hollywood films, television shows and theatrical productions. Many have found new homes in museums, art galleries, and historical and private collections throughout the world. Rue de la Paix is a member of The Costume Society of America, and The Vintage Fashion Guild. Why did I choose the name Rue de la Paix? The Rue de la Paix in Paris, France, is a name synonymous with the finest shopping in the world. From the early days of Napoleon to the present day, the ateliers and showrooms of the Rue de la Paix and surrounding avenues have been home to the best of Haute Couture fashion designers, jewelers,textile designers, couture millinery, perfumeries, and designers of the finest in luxury items of all kinds. French milliners of the Rue de la Paix such as the great Caroline Reboux, Madame Suzy, Madame Virot, Camille Roger, and J. Suzanne Talbot have inspired me throughout my career, and so it seemed the most fitting name for this salon. If you are here to shop, my goal is to bring you unique items, superior customer service and a memorable buying experience. If you are here to browse, by all means do! 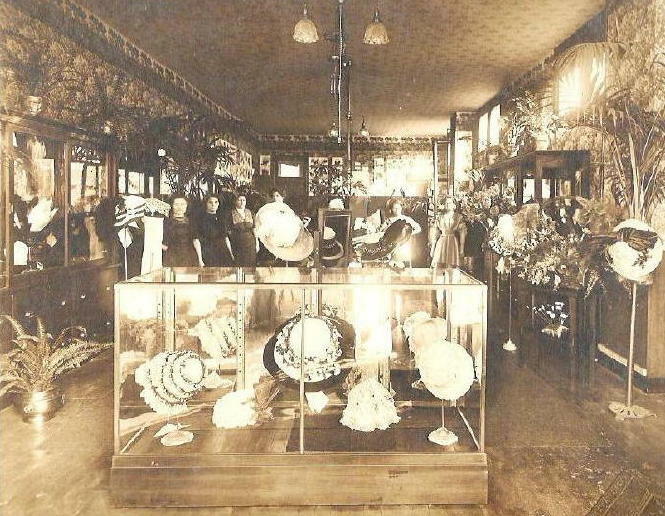 In mid 2014 the Photo Gallery and Millinery Parlor pages will be expanded, to inspire a greater appreciation of millinery history and hat fashions of the past. If you have questions concerning hat collecting, dating hats, or millinery history, please ask and I will do our best to respond in a timely manner. We are also available to assist organizations, historical societies, museums and the private collector, often at no cost to you. Whether your interest is Victorian millinery, Edwardian hats, Downton Abbey Hats, Flapper and Art Deco hats, 1930's, 1940's or 1950's vintage hats, we hope to assist you. To give you an idea of the hats in our collection, here are the names of just a few of the milliners and Haute Couture designers whose creations will be offered for sale in the coming months: Please inquire if you would like to purchase any of these before they are offered on the website. 19th and 20th century Paris: Hats by Caroline Reboux, Madame Virot, J. Suzanne Talbot, Camille Roger, Maria Guy, Maison Lewis, Georgette, Agnes, Berthe, Pouyanne, Josse, and more....20th Century hats by Rose Valois, Jaques Fath, Givenchy, Elsa Schiaparelli, Christian Dior, Heim, Jean Patou, Coco Chanel, Jean Barthet, Legroux Soeurs, Paulette, Claude Saint-Cyr, Mme Suzy, Orcel, Varon, and more. Also hats by American and London designers such as: Bes-Ben, Lilly Dache', Hattie Carnegie, Gilbert Adrian, Howard Greer, Walter Florell, John-Frederics, Laddie Northridge, Caspar-Davis, Archie Eason, Bill Cunningham, Otto Lucas, Norman Durand, G.Howard Hodge, Adolfo, Charles James, Tatiana, DeKoven, Don Marshall, Frank Olive, and other well known American hat makers and talented milliners from the 19th and 20th centuries. Please sign our GUESTBOOK, and Mailing List, and perhaps tell us a bit about yourself and what you collect. MERCI, and THANK YOU for visiting Rue de la Paix.